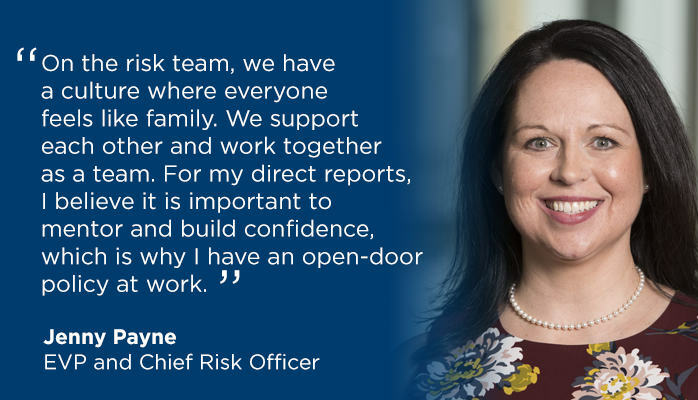 Executive vice president and chief risk officer, Jenny Payne, shares how she supports her team at UMB. There’s not always an obvious path for this, so it’s important to identify and proactively act on ways you can make new and meaningful contributions. When I started at UMB, no one thought corporate risk was an exciting job, but I was energized about the value an independent risk partner could bring to the organization’s risk culture. Since that time, our department has grown in concert with UMB’s evolution to a $21 billion financial services company, while navigating changes in the banking regulatory environment. In my roles, I have had the opportunity to guide the evolution of enterprise risk management from textbook theory to real-life application. Was there a checklist of items I was asked to specifically tick off one-by-one? No. Did I take the opportunity to create a plan to help us evolve and progress? Absolutely. My advice will be to always follow through and speak up when you spot opportunities for change or improvement. Perception can be both a powerful tool and an obstacle to overcome in the workplace. Risk management can be viewed as an opportunity killer, but my team strives to be a strategic partner for our leadership team and guardians for our external customers. As chief risk officer, I am responsible for UMB Financial Corporation’s enterprise risk management program, including information security and privacy, corporate compliance, anti-money laundering, operational risk management and loan review. I have a leadership team of seven direct reports and supervise more than 80 risk professionals. Rather than viewing the risk team as “regulators”, we have shifted perception so our colleagues understand that our goal is to help management make the best business decisions, within a defined risk appetite, without any surprise events. In my role at UMB and in the community, I need to have strong, trusting relationships, so it is imperative that I nurture relationships with those around me and maintain open lines of communication. I am most proud of the risk dialogue that now occurs at all levels of UMB and the consistent understanding of our risk appetite. The result is a better-informed understanding of the internal and external risks UMB strives to mitigate to achieve its strategic objectives. On the risk team, we have a culture where everyone feels like family. We support each other and work together as a team. For my direct reports, I believe it is important to mentor and build confidence, which is why I have an open-door policy at work. I serve in girl’s ministry as a third through fifth grade teacher at Overland Park First Assembly of God church. Each Wednesday night, we talk about self-image, serving others and various topics that impact their lives. I get to build solid relationships and encourage them as they enter the tumultuous time of middle school and adolescence. This has been a very rewarding opportunity, as I am able to watch these girls grow into young women. Extending relationship-building beyond the four walls of your workplace is an opportunity to grow your network and skill set. Learn more about UMB and how “More defines us.”. Also, stay informed on industry trends and noteworthy company news by visiting our UMB in the News section on umb.com or following UMB on LinkedIn.